In the past week or so, much of the press has covered the trial and conviction of Forest Gate Isis supporter Umar Ahmed Haque on a number of serious terrorist offences. During Mr. Haque’s trial, the court heard extensive evidence about his activities at two schools and a madrassa in East London, where (amongst other things) under the guise of teaching ‘Islamic Studies’ he ‘re-enacted attacks on police officers and showed…videos of beheadings’. It is estimated that 110 of his pupils were ‘radicalised’, a third so seriously that they are now receiving long-term safeguarding support, of course at the taxpayer’s expense. Much of Mr. Haque’s proselyting, it is reported, occurred in Barking, but some occurred at the independent Lantern of Knowledge secondary school in Leyton, where he was employed from September 2015 to September 2016; and given the long and disturbing history of Islamist extremism in Waltham Forest (see links below), it is worth scrutinising this part of the story in more detail, particularly as regards those agencies that are charged with protecting the integrity of our education system. First, what of Ofsted, the Office for Standards in Education, Children’s Services and Skills? It has the legal duty, as its website explains, to inspect and regulate ‘services that care for children and young people, and services providing education and skills for learners of all ages’. So what role did it play here? The arrangements for safeguarding are effective. Leaders are diligent in their approach to ensuring pupils are safe; clear and comprehensive procedures support this. Regular training for staff, governors and parents helps keep pupils safe both in school and at home…The school checks carefully any visitors to the school to ensure they do not promote any extreme views or pose a risk to pupils’ well-being. The school has a positive relationship with the local authority and regularly utilises training opportunities’. That’s the part of the story which – for obvious reasons – the press has tended to focus on, but in fact Ofsted’s subsequent involvement is equally interesting. In April 2016, Mr. Haque was stopped at Heathrow as he attempted to board a flight to Istanbul, a well-trodden route to Syria for aspiring Isis recruits, and according to the Guardian, in the following month he had his passport revoked. In September 2016, Mr. Haque left Lantern of Knowledge for good, and almost simultaneously the Department for Education received a complaint about ‘safeguarding, pupils’ behaviour and the promotion of fundamental British values’ at the school, and called Ofsted back in. This time, the inspectors visited unannounced, toured the site with the head, dropped in on three classrooms, talked to the chair of governors, and reviewed key documents. All appointed staff have completed the required safeguarding training, including training in the “Prevent” duty’. However, the Department for Education clearly remained cautious, adding ‘concerns’ about pupils’ welfare and health and safety to those already articulated, and a further unannounced Ofsted inspection was arranged for June 2017, with one of Her Majesty’s Inspectors brought in to strengthen the Ofsted team. This time the outcome, while not wholly negative, was certainly notably less favourable. Inspectors saw evidence that staff had signed a document to say they had received, read and understood part 1 of the guidance “Keeping Children Safe in Education” (September 2016). However, discussions with leaders and staff demonstrated that they do not understand the guidance’. The good news was that safeguarding, as the inspectors saw it, was no longer an issue, with staff having ‘a secure understanding of statutory guidance and the school’s own policies’. 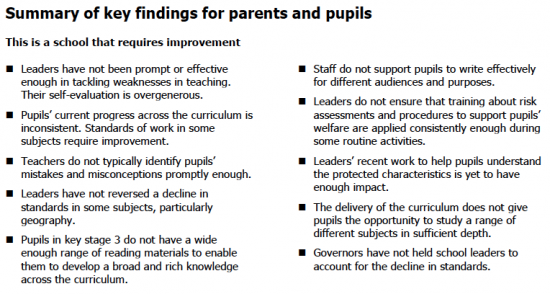 What to make of Ofsted’s involvement? Some press reports imply that Ofsted is culpable because it failed to identify Mr. Haque’s pernicious influence at the time of its 2015 inspection, and Mr. Mathew Coffey, the organisation’s deputy chief inspector, perhaps has added credence to this view by recently expressing ‘deep regret’ at the fact that Mr. Haque was able to work with children. Whether this particular charge sticks remains to be seen. As previously stated, Mr. Haque joined the school in September 2015, but it is unknown exactly when he started teaching ‘Islamic Studies’, and, more pertinently still, when he began concentrating on ISIS propaganda. Hence, it is possible that, at the time of the Ofsted inspectors’ visit in November of that year, his classes were entirely uncontroversial. It is also worth remembering that, as evidence presented at his trial showed, Mr. Haque was at pains to cover his tracks, and on occasion threatened those in his care in order to muzzle them. And, in an atmosphere where he circulated gruesome images on a weekly basis, it requires little imagination to understand why children (and possibly even adults) would take such threats seriously. However, this is by no means enough to give Ofsted the benefit of the doubt. For though the 2015 inspectors went out of their way to praise the school for both managing changes in staffing (citing an appropriate induction process, and ongoing support) and (as already noted) rigorously monitoring classroom performance, the reality was that Mr. Haque had been taken on as an administrator rather than a teacher, possessed no teaching qualifications, enjoyed unsupervised access to children, and taught them what he wished. Moreover, Ofsted’s overall engagement with the school also appears flawed. Given the complaint of late 2016, the agency had good reason to investigate vigorously. Yet when read in sequence the subsequent inspectors’ reports constitute a less than satisfactory response, a series of ad hoc interventions rather than a coherent and cumulative search for the truth. Thus, issues around safeguarding were not addressed in a consistent way, making it impossible for them to be tracked across time; and there was little or no attention paid to ‘Islamic Studies’, despite this subject being so central to the school’s primary mission. To make matters worse, the inspectors on occasion appear to have been surprisingly incurious. Revealingly, though the October 2016 and June 2017 teams spent plenty of time with the school leadership, which was no doubt understandably keen to present its endeavors in the best possible light, neither met any parents, surely a regrettable oversight. A second supervisory body that merits scrutiny in relation to this case is LBWF, a council that (for reasons which continue to be unclear) imagines itself to be an exemplar in the fight against extremism, and in fact provides the London Prevent Board with its chair (Chief Executive Martin Esom). This initially seems plausible, but a moment’s reflection prompts doubts. LBWF is of course correct in stating that it had no direct statutory responsibility for Lantern of Knowledge. However, it is difficult to believe that this meant interaction never occurred. As already noted, in 2015 Ofsted found that the school had a ‘positive relationship’ with the local authority, for example taking advantage of the latter’s training opportunities. It is conceivable that such a happy situation was short-lived, but unlikely. Waltham Forest has a large Muslim population, and a group of councillors who are active on its behalf. There are not many independent Islamic secondary schools in the area. Is it really plausible that Lantern of Knowledge for a period of two or three years existed entirely outside of LBWF’s orbit? As to the specific contention that until mid-2017 LBWF was in the dark about Mr. Haque’s activities, that too seems improbable. After all, Mr. Haque was considered enough of a threat in 2016 to be stopped at Heathrow, and subsequently have his passport removed, so even then must have been on some kind of watch list. Likewise, though Ofsted appears not to have taken much notice of Mr. Haque as such, the news that it kept returning to Lantern of Knowledge surely must have percolated through to the Town Hall. Perhaps LBWF kept quiet because it feared jeopardising a police operation, but if that was the case, would it not say so now in order to gain kudos? So all in all, under scrutiny the LBWF statement swiftly begins to disintegrate. In conclusion, it is obvious that there is much more to come out about this case – about the reasons why Ofsted and LBWF acted as they did; about Lantern of Knowledge, and who in the school knew what, and when; and about Mr. Haque himself, especially regarding his stated sectarian hatred of Shia Muslims, and the wider network he was involved in. The Charity Commission has just announced an inquiry into the Lantern of Knowledge’s parent body, Lantern of Knowledge Educational Trust, and hopefully that will prove enlightening. The regrettable thing, though, is that public confidence has unarguably already been damaged. One key requirement for a free, tolerant, and inclusive society is that the various regulatory bodies act efficiently and without fear or favour. And as regards Mr. Haque and Lantern of Knowledge, there will be many local residents who legitimately remain to be convinced that they did.